It's considered the Holy Grail of baseball card collecting. But, just how many 1909-11 T206 Honus Wagner baseball cards exist? Conservative estimates place the number around 50 while more generous guesses edge toward 75 to 100. 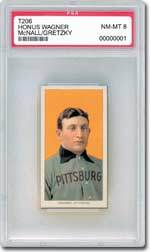 MastroNet, Inc., the premier Sports and Americana auction house and PSA (Professional Sports Authenticator), the leading authenticator for trading cards and sports memorabilia, are teaming up to assemble the largest display of 1909-11 T206 Honus Wagner baseball cards ever to be exhibited. The collection will include the world's most expensive baseball card -- the $1.265 million PSA NM-MT 8 T206 Honus Wagner, which will be on display at PSA's booth. In addition to the top Wagner card, MastroNet has secured a number of other higher-grade examples of the card for the once in a lifetime exhibit. MastroNet is encouraging all Wagner owners to participate in this historic display. Doug Allen is optimistic that such an event will also result in previously unknown T206 Wagners surfacing. Also, with a nod to the April 3 event of National Trading Card Day, Allen hopes the event will help fuel new interest into card collecting as a hobby and activity families can enjoy together. "There is an impression that all the valuable vintage baseball cards, including the T206 Wagner have been found," said Allen. "Proof to the contrary is the T206 we are offering in our April sale. It's a brand new find to the hobby." The card Allen is referring to is a PSA 1 Wagner that is expected to bring well over $50,000 at auction. A Wagner "find" with a gem mint grade would produce a multi-million dollar pay-off, a figure the auction house says many collectibles sources would pay outright for such a find. "It's definitely worth taking a second look through attic contents, old albums and safety deposit boxes," said Allen in regard to the search for new Wagners or any other vintage cards. "While we know there are a limited number of T206 Wagners out there, to date, we don't believe we've seen them all." Allen adds that this contention extends to all other vintage baseball cards. "Periodically, we see new material," said Allen. "Some of it substantial such as the 100 unopened wax boxes also offered in our April auction. It's the biggest find of its kind in almost 50 years." The lore surrounding the scarcity of the 1909-11 T206 Honus Wagner card is attributed to the baseball player's objection to being used to promote tobacco. Wagner forced the cigarette companies to halt production of the card with his image on it -- a major coup for an athlete in that era. The cease in production, for whatever the actual reason was, resulted in the legend of Wagner's card and the low number of examples in existence. "While there are rarer baseball cards, none hold the appeal and value of the Wagner," said Joe Orlando, president of PSA. "It is the hallmark of the card collecting hobby -- the card everyone wants to see." If that's the case, attendees to this year's National Sports Convention, which will take place in Cleveland on July 22 through July 25, are in for an eyeful. "It will be part of the most valuable assembly of baseball cards ever seen," said Orlando. For more information on the T206 Honus Wagner exhibit or to have your Wagner included call 630-472-1200 or visit www.mastronet.com.